I always meant to say it since his victory against Tirado of Mexico at the Orleans Hotel last February and his recent hard-fought victory over a game Chuwatana of Thailand to capture the OPBF super flyweight title: Watch out Filipino boxing stars, one more fellow is coming up the top and the place is getting tight. Make a small room for him, Manny! Scoot over a little bit, Boom Boom! Z Gorres, the pride of Mandaue, Cebu is on the way! 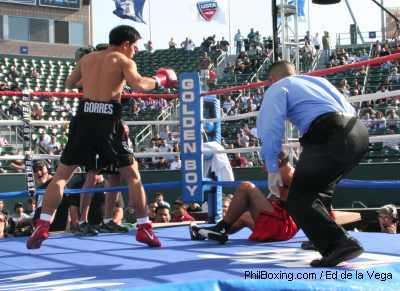 Rincon Miranda was sent to the canvas by Z Gorres in this bit of action from yesterday's fight. Gorres, won a sensational bout over a wily veteran from Cartagena, Bolivar. Columbia, Pedro Rincon Miranda. The fight was what it was promised to be by the Golden Boy Promotions of Oscar de la Hoya. It was a classic show of the sweet science, a boxing clinic par excellence. And, who said there ought to be a total KO for a boxing match to be entertaining? Gorres took the initiative from the very beginning with is stiff jabs and power combinations resulting in a quick knockdown in the first round. The Columbian however, put up a good fight delivering his own combinations that demonstrated why he has a record of 23 KO's in 30 fights. In the 5th round Gorres did it again but was unable to finish off Miranda. Then he did the same thing on the 10th but veteran foe kept on coming. 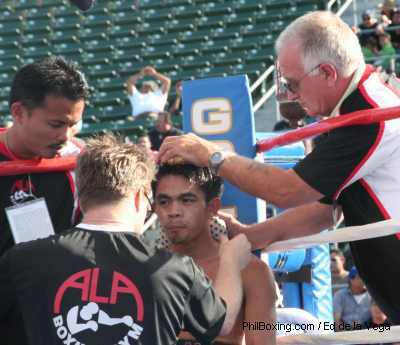 Z Gorres was being attended to at his corner headed by 2004 Trainer of the Year Freddie Roach. Although the Columbia gave it all, Gorres would not be denied his victory tonigh, not with what people back home in the Philippines were expecting him to do particularly after the very recent US victories of Czar Amonzot in Las Vegas and Boom Boom Bautista in Los Angeles.. He had to carry the ALA and the Philippine flags to victory. Of course, it goes without saying, he needed to hoist the Golden Boy flag of Oscar de la Hoya as well. 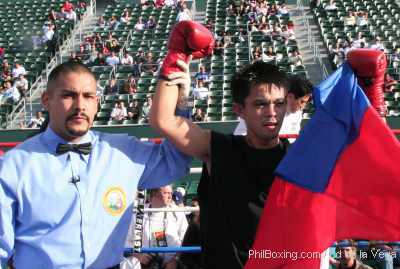 Following a game plan laid out by the master himself, Freddie Roach and the very able ALA Gym chief trainer, Edito Ala Villamor, Gorres was a picture of good offense and effective defense. It was technical proficiency galore! It's not that he didn't get tagged by Miranda, who also had his spurts of offensive display, but such spurts were few and in between what Gorres had delivered. In the end, it was youth, style and conditioning that triumph over age and experience. Gorres won by unanimous decision. The score cards on all the 3 judges read the same: 100-87. Gorres' hand was raised to victory after totally dominating his Colombian opponent. Photos by Dr. Ed de la Vega / PhilBoxing.com.